Birdy Bucks Pokie Review - Play Today! Big bucks comes with the life of a professional golf player, life the good life and win great with this pokie offering you the chance to get your earnings up with a large variety of winning shots. NuWorks Gaming takes players to the action on the well-manicured golf estates. Hit the winning shot on 5 reels offering 25 paylines ready to rewards. 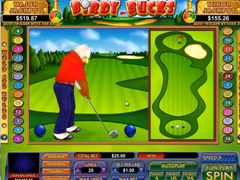 A great selection of features are ready to give you additional wins that will make you hit the winning target time after time with golf ball scatters, eagle wilds, hole in one features, free games, win-win features and multipliers. The game offers even more riches from two progressive jackpots. The game gives you 25 lines that will play a big part of the amount you wager per spin. Each of the lines will need a bet per line from $0.01 to $1.00. The game allows you to change the amount of lines you play. You can choose from 1 to 25 lines per spin. 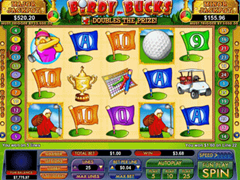 This pokie keeps you glued to your screen with interesting gold course bonus games and well-designed symbols of the birdie dressed in pink that is truly a nice looking bird, white golf balls, golden winner’s trophy, white golf cart to take you through the 18 hole course, score card with blue, red and green pencils, multi-coloured flags that offers the poker symbols as hole numbers and the golfer dressed in red holding the club that will get the wins. The eagle symbol will be wild. It can be displayed on all the reels with features to complete combinations by replacing themselves for needed symbols. Scatter symbols cannot be swapped whatsoever. All wins featuring the wild in their combinations will award double the standard prize. White golf balled are the scatter symbols. You can get them to bounce onto all reels during a spin. You will need at least 3 to activate the bonus game or to trigger the multiplier rewards offered. You will receive in access of 200 times the bet amount. The hole is one game will start when you obtain at least 3 of the golf balls. In the game a golfer will hit 3 balls. The first ball will determine the amount of free game you gather, up to 18 is available. The second ball will provide a multiplier reward, which can give you up to 9x and the third could give you bonus payouts. This interesting pokie offers the great outdoors with a huge variety of winning combinations that eagerly combines with colourful symbols of the great game of golf. Enjoy every spin with fantastic winning chances enhanced by the active features. When 5 of the eagles are displayed the progressive jackpot will be awarded, please not all 25 lines need to be played.